For those of you that did not have the opportunity to see one of the Metropolitan Museum of New York’s costume Institute’s most highly attended and successful exhibit, Charles James (see review), take heart because he is one of many other important American designers that is going to be included in a new exhibit coming to San Francisco (March 14 – July 19, 2015) called High Style: The Brooklyn Museum of Costume Collection. 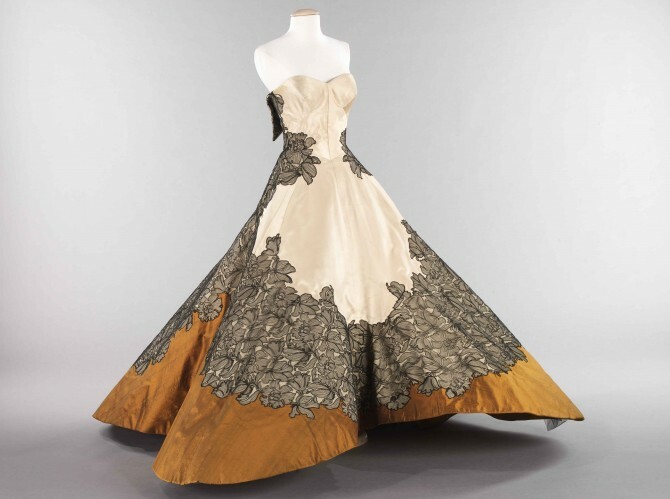 This special exhibit will display some of Charles James’s brilliant creations, as well as original sketches and pro-type muslins that reveal the details of his masterfully executed gowns. These examples are all part of the exhibit’s theme, which traces the evolution of fashion from 1920 to 1980. Special attention is made to the pioneering American women designers working in the 1930s and 1940s, such as Bonnie Cashin, Elizabeth Hawes, and Claire McCardell, and their male counterparts, including Norman Norell, Mainbocher, and Gilbert Adrian. This upcoming exhibit is destined to be a huge success, especially in the sense that many of the most brilliant American designers of this period are largely unknown to those outside of the fashion world. Wow…am not coming in Oct. (free ticket fell thru)…maybe this is why…March instead!!!!!! Great. I think it would be fun to get a bunch of PSC folks together to go to the exhibit. We can view it through the PSC lens! This is WONDERFUL news!! I am eager to share with my friends and to see those lovely creations again. Wow, what an amazing dress! I can picture Audrey Hepburn wearing it to a movie premiere.